1. Drain the cherries, reserving 6 tbsp of the syrup. Stir the coffee into the syrup. 2. 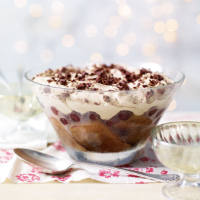 Dip the trifle sponges into the coffee-syrup mixture and use to line a glass trifle bowl. Scatter over the cherries. 3. In a separate bowl, whisk the Baileys, mascarpone, cream and sugar together until it forms soft peaks. Spoon the creamy mixture over the cherries and smooth over the surface. Grate the chocolate on top then cover and chill until ready to serve.